The reasons for acquiring a bulldog is important. 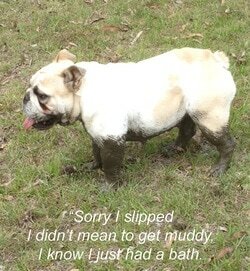 Given a bulldog's innumerable talents, the best reason for getting any dog is to enjoy the pleasure of it's company. They can make you laugh when you do not have an inclination or a reason to, and they can coax a smile from your soul on the most grim, cheerless days. General Appearance: Smooth-coated, thickset dog, rather low in stature, but broad, powerful and compact.